This section of trail offers white sandy beaches, grazed coastal meadows and one picturesque fishing village after another, as you follow paths and small roads along the southeast coast of Skåne. If you like knights or ancient geology and fossils, then this is the hike for you. This section of Österlenleden Trail starts at the white sandy beach at Borrby strandbad. From here travel 570 million years back in time to when Skåne lay in the southern hemisphere covered by sea. At Brantevik there are markings in the stone from waves moving along the ancient seabed, leaving impressions in the soft sand. These impressions were preserved as the sand slowly solidified into sandstone. Erosion has exposed these markings. South of Nabben, and some 30 million years later, you can see where algae and seaweed built up and rotted, releasing their minerals into the soft sand, today visible as black lumps in the sandstone. And at the edge of the water at Gislövshammar you can see the slender, elongated fossilised remains of extinct cephalopods, octopus-like creatures. When you pass the open, grassy heath at Norrekås keep your eye out for such sun-loving rarities as dwarf everlasting and sand pink. North of Skillinge, you find ancient pastures and small woodlands, and bare rock down towards the shoreline. During the spring and autumn, this is a good place to watch for migratory sea birds. Just south of Brantevik is the only place in Sweden where the moss Tortula randii grows. 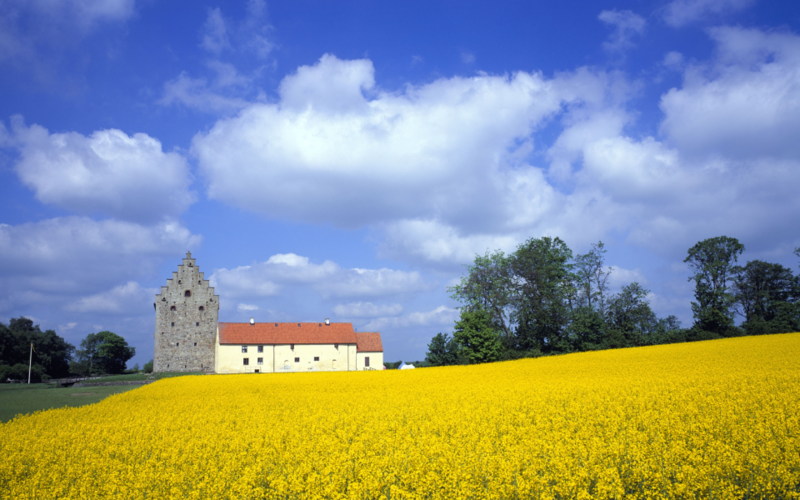 A few kilometres from the trail, you can visit the most well-preserved medieval manor in Scandinavia – Glimmingehus. The building is more than 500 years old and was built by a wealthy Danish knight, as evidenced by the highly exclusive artefacts which have been recovered there. This is a mecca for those interested in medieval chivalry, but tourists are not the only visitors. Ghosts – animal and human – are said to haunt the manor and the lands around it. For centuries, fishing was the most important source of income, and there are good fishing locations all along the coast. Many of these developed into the little fishing villages you pass through today, and in most you can explore the associated harbour. At Örnahusen, keep an eye out for the stone quays, an old underwater construction with channels where the boats could come in and moor. Brantevik developed into a major sailing harbour, and by 1899 its fleet of sailing vessels amounted to 118. If you are interested in sailing, visit Branteviks Maritima Museum. 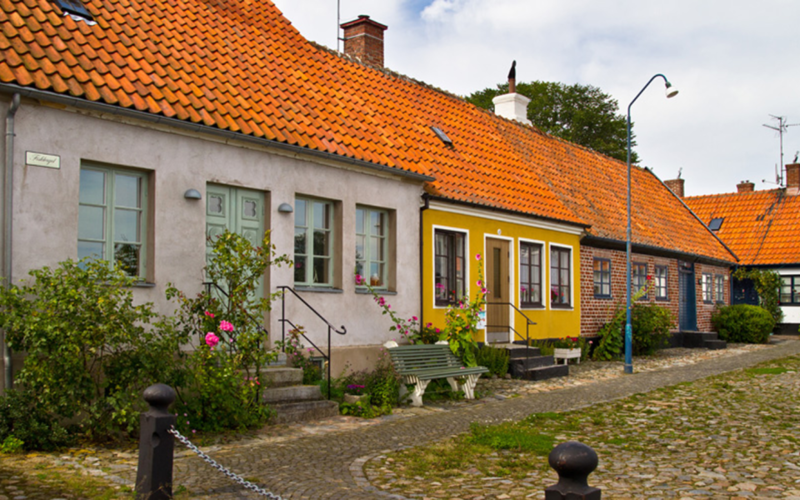 Simrishamn is first mentioned in 1161 and two hundred years later it was referred to as a town. Sankt Nikolai Church in the town centre is also first mentioned in 1161, but was most likely just a small chapel at that time. The limestone baptismal font is from that period. Take the time while you’re at Simrishamn to seek out the many petroglyphs in the surrounding area. We can only wonder what significance these figures of ships, sun wheels, axes, and animals held for the people who chiselled them painstakingly into the stone. You can also find elf mills sculpted into stones. No one can know for sure if they were practical or for use in rituals, but they are extremely common throughout Sweden, and indeed throughout the world. 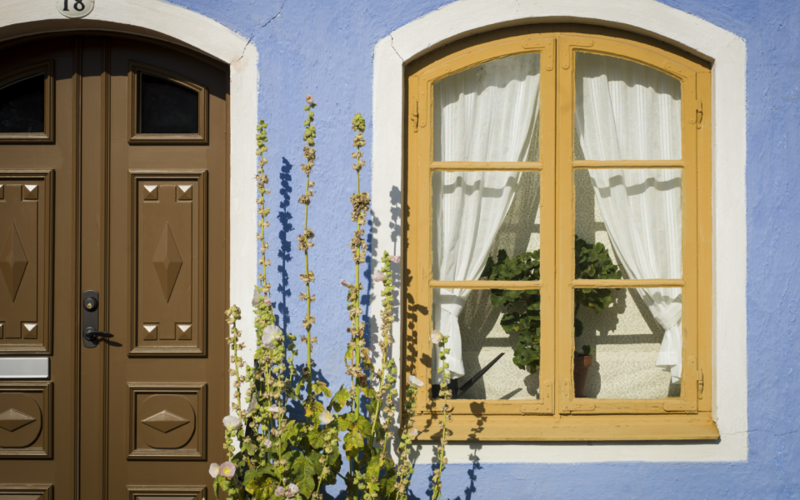 The name elf mill reflects medieval superstition. They are more commonly known in the world of archaeology as cupules, or bowl depressions.